Shown above is a line of any length and a Point P. Point P can also be placed below the line for the same principles to work. Line segment AB and PD are congruent because they were both drawn with the same compass width. Line segment AC and PE are congruent because they were both drawn with the same compass width. Line segment BC and DE are congruent because they were both drawn with the same compass width. Therefore triangles ∆ABC and ∆PDE are congruent because they have 3 sides congruent. Angle BAC and DPE are congruent because corresponding angles of congruent triangles are congruent. The line AD is is drawn with a straight edge and cuts across lines AC and PE. 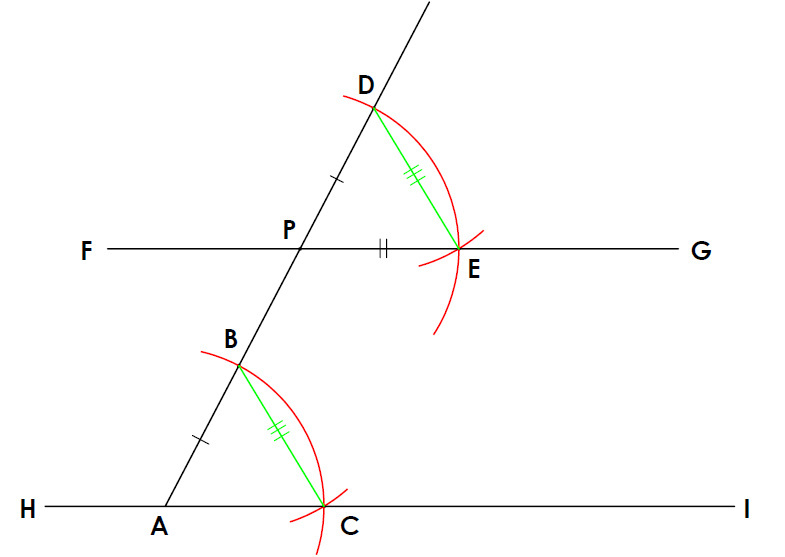 Lines AC and PE are corresponding angles that are equal in measure, therefore line FG and HI are parallel.